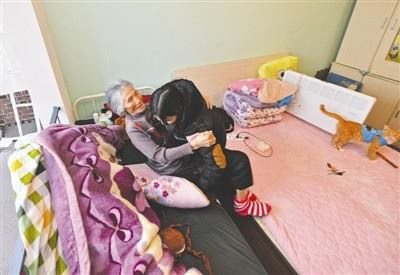 A story about the strong bond between a 20-year-old girl and her 93-year-old grandma has tugged at heartstrings across China. The decision to take her grandma along with her while continuing her studies, indeed, was not that easy for Liu Lin, a sophomore at a college in southwest China’s Chengdu city. Liu Lin made a warm cozy home for the two of them out of a small rented house near the campus. To make time to cook her grandma breakfast Liu has to get up half an hour earlier than before at 7:30 am. After the morning classes, she rushes home for lunch, making some hot tender food for the almost toothless grandma. And the devoted granddaughter knows better than anyone else about what the old lady likes: her favorite snacks like sausage and marshmallow are always within reach, the computer has stored tons of the grandma’s beloved war movies for her to watch, and on warm days, the granddaughter carries her downstairs and wheels her out for a breath of fresh air.